Waffling: Prepping for My Bathroom Reno! 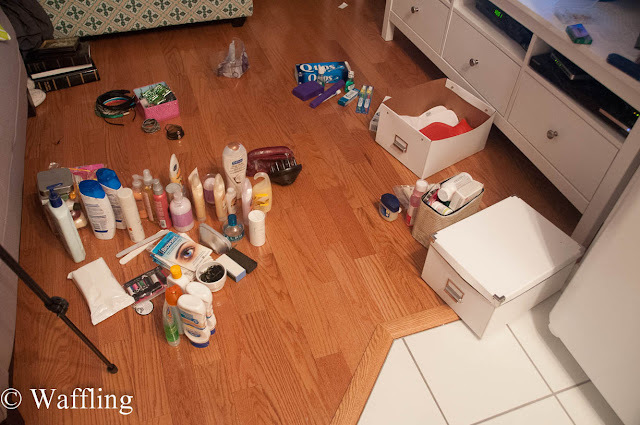 As prep work for my Bathroom Reno, I decided to clean out my bathroom and toss a bunch of stuff. 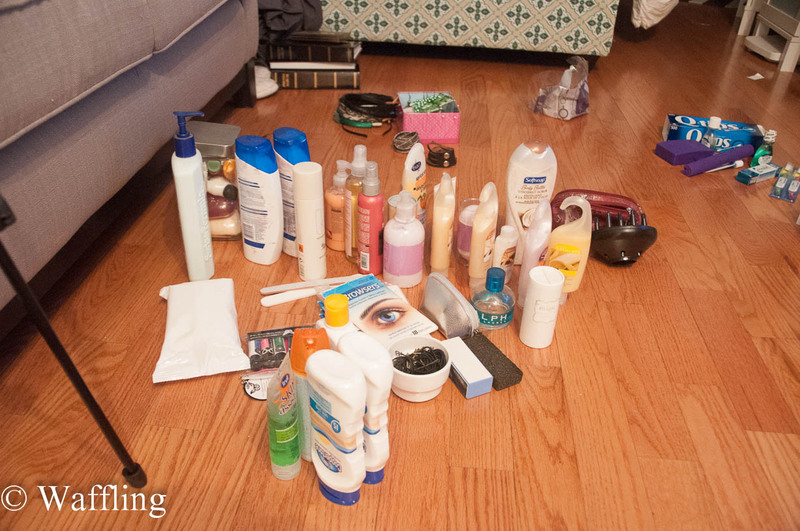 Being a girl, people often buy me moisturizers and things of that nature, which I save and NEVER use! I actually only moisturize my legs in the winter and my face year round. That's it (I luckily do not have dry skin!). So I do not need to hold onto all this stuff! Yikes. Stuff Everywhere! I cleaned out the entire medicine cabinet and under the sink (almost everything on the sink I use daily). I then kind of organized by type in the living room. Look at this pile of body washes and moisturizers! I am actually keeping all the body washes because I will eventually use them! 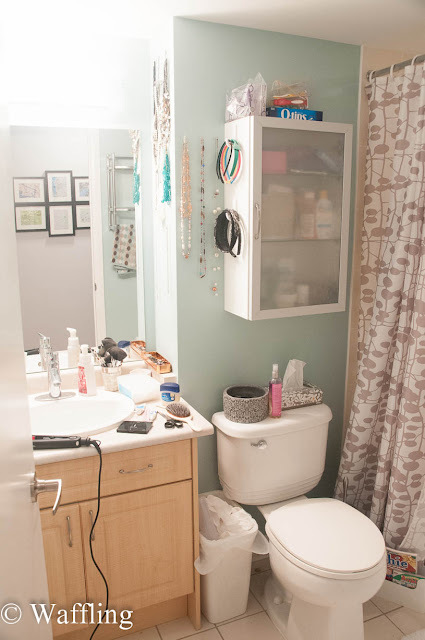 I was able to fit everything I was keeping from the above photo into one white box, which went under the sink. I have a huge bag of give away stuff now that I am sure my friends will be happy to take off my hands. Very little stuff actually went into the trash. 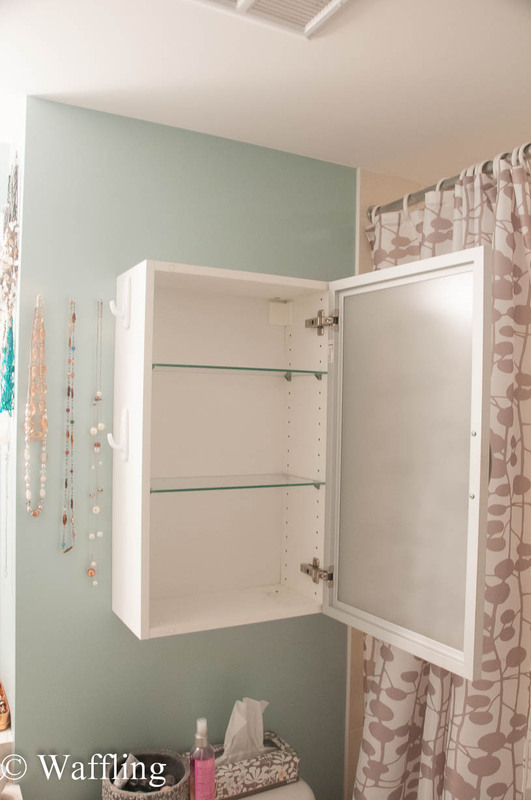 Now I have an empty medicine cabinet and it feels good! I have all sorts of plans on how to add more storage into my bathroom and this medicine cabinet probably won't stay because I don't think it is the best use of space (I would like something wider and with a solid door). I still haven't quite decided if I just want to replace the whole thing with nice floating shelves and work on making the vanity base my useable for storage. We shall see! I need to do this so bad. Motivate me, oh wise one! You just gotta DO IT. no excuses! Casey is right, Sloan! As what the famous sport apparel commercial says: JUST DO IT! Some might not know it, but prepping is a lot of work too. You have to remove all the things and clear the space to avoid obstruction. You will reap its benefits when you start with the remodeling process. No hassles. All work!